Product prices and availability are accurate as of 2019-04-06 07:34:19 EDT and are subject to change. Any price and availability information displayed on http://www.amazon.com/ at the time of purchase will apply to the purchase of this product. This hand rolled art glass shade is gently coned in a leafy shape in blended green tones. Insets of matching jewels are at the shades bottom edges. 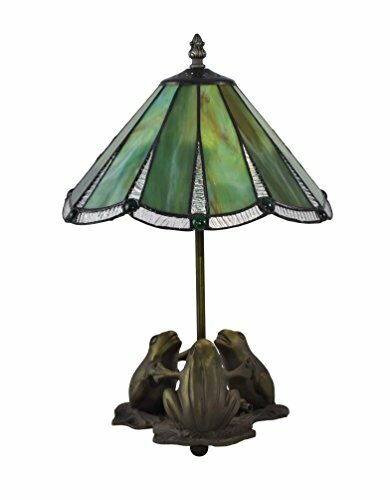 The beautifully metal base features 3 Frogs holding the column of the base in a antique brass finish. The perfect choice for bedrooms and living rooms, our terrapin table lamp does double duty as both a functional lamp and illuminated artwork that you will proudly display anywhere in your home for many years to come.